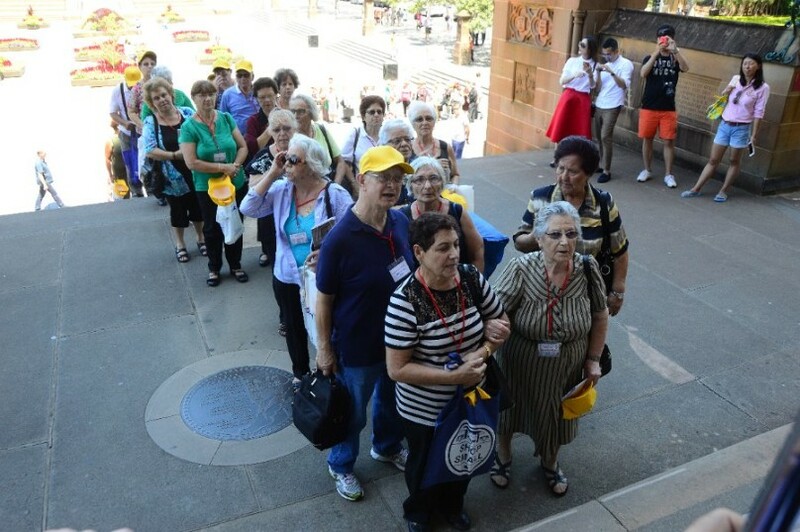 Worshippers from across the archdiocese’s Italian communities took part in a pilgrimage to the holy doors of St Mary’s Cathedral. A group of Italian Catholics who made a pilgrimage to the holy doors of St Mary’s Cathedral last month are encouraging others to follow their example in this Year of Mercy. The Archbishop of Sydney, Archbishop Anthony Fisher OP, opened the holy doors on 13 December, after Pope Francis launched the Jubilee of Mercy last April. More than 160 pilgrims from across the archdiocese’s Italian Catholic communities were led by six Italian-speaking priests. The pilgrimage was promoted by the Italian community of St Joseph’s parish, Moorebank, and inspired by the John 10:9 verse, ‘Jesus is the door to the Father’s mercy’. Its purpose was to encourage Catholics to live fully during this exceptional year. Departing from Hyde Park, pilgrims walked through the holy doors of St Mary’s Cathedral, reaching the crypt of the Basilica for the liturgical celebrations. Pilgrims were given the opportunity to participate in the Rite of Reconciliation with individual confession and absolution of the faithful, followed by the Holy Mass, sung by the Moorebank and Mount Pritchard parish choirs. Speaking Italian, Fr Andrew James presided over the liturgical celebrations, together with Frs Dominic Ceresoli, John Iacono, Pierluigi Passoni, Maurizio Pettena and Adriano Pittarello. As they returned home, pilgrims fulfilled the conditions for the granting of plenary indulgence by praying for the intentions of the Holy Father. The pilgrimage also served as a vote of thanks to the archdiocese from the Moorebank Italian community for the continued celebration of the parish’s 10.45am Sunday Mass in Italian.